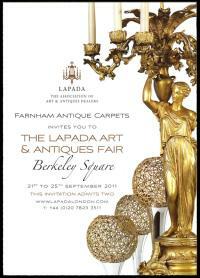 The LAPADA antiques fair located in Berkeley Square is finally upon us and we are pleased to have some exciting carpets & rugs to showcase this year. The fair is in the heart of Mayfair and is a fabulous day out, with a huge variety on display as dealers exhibit from all over the country. We would be delighted if you would like to visit us and also see everything else the fair has to offer. If you still need an invitation please contact us and we will happily send you one, for more information on opening times, please click here. We are located in the rear marquee next to the bar – we hope to see you there.